"SHE was like a rock," admitted defenseman Colleen Sostorics, referring to Edmonton-born goalie Shannon Szabados' shutout to win gold at the 2010 Winter Olympics in Vancouver. The team beat the U.S. 2-0 last Thursday (Feb. 25), and Szabados made an impressive 28 saves. "I was standing there on the blue-line after and I thought to myself, 'I can't believe I got a shutout'," remembered Szabados, 23, who is of Hungarian descent. "But I would have been satisfied with a 9-8 score, as long as we won." St. Albert's Meaghan Mikkelson, 25, is also part of the world's best female hockey team, which also won gold medals at the Winter Olympics of 2002 and 2006, in Salt Lake City and Torino, respectively. They won silver during the 1998 games in Nagano. Szabados' goaltending career began long ago, when her father Gary brought home a set of goalie equipment when she was about seven. "She was so delighted she was walking around the house wearing the pads all evening," recalled Shannon's mother Sharyl. "After a while I peeked into her bedroom and there she was...sleeping with her pads on." Shannon's idol growing up was former Oilers' netminder Bill Ranford, and so it seemed fitting that she was enrolled at a school run by the Manitoba native. Fast forward to today and Szabados is running her own schools, with Stanley Cup champ and Sherwood Park native Cam Ward. 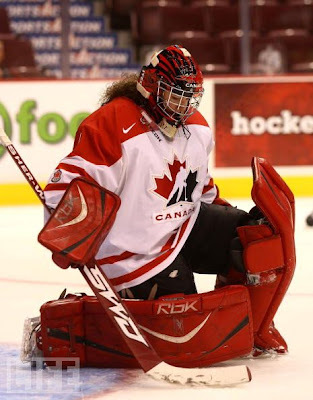 When she was just 15, Szabados became the first female to play in Calgary Mac's AAA midget hockey tournament, and the following year, in '02, was the first female to play in the Western Hockey League (WHL). On September 22nd of that year Szabados played just 20 seconds of a regular season WHL game, making her the first woman to do so. Not surprisingly, Szabados was criticized and even tormented at times for playing with the boys, and it "got to the point where she almost quit," Gary said. There were accusations that that groundbreaking WHL game was simply a publicity stunt, but the team's general manager Bob Tory took the bulk of the public flak. Szabados prospered when she joined the AJHL (Alberta Junior Hockey League), predominantly with the Fort Saskatchewan Traders. She was named the league's Top Goaltender in 2007. She currently plays with the men at Grant MacEwan University. This was Szabados' first time competing in the Olympics. 18-year-old Marie-Philip Poulin, of Beauceville, Quebec, scored both goals for Canada in the gold medal game.